On Friday, December 7, the current Russian Prime Minister and former President, Dmitry Medvedev, made some startling off-air comments to reporters while his microphone was still switched on. He was asked whether the President is given any secret files on extraterrestrials while in office. In his responses, Medvedev not only confided that extraterrestrials are visiting the Earth, but that some are actually living among us. He went even further to say that the Hollywood comedy, Men in Black, depicting a secret government agency monitoring extraterrestrials on Earth, has a factual basis to it. While the comments appear to be playful responses to a reporter’s off-beat question, they raise questions over exactly how much truth was being revealed by Medvedev. 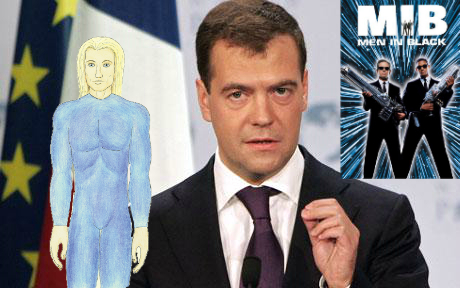 Given that Medvedev’s responses were said off-air, without him realizing that his microphone was still recording, they at face value give credence to claims that extraterrestrials are not only visiting our world, but are even living among us. Medvedev’s comments are not the first time a prominent Russian official has spoken out about extraterrestrial life while giving television interviews. In an extraordinary television interview aired in May 2010, the Governor of the Russian Republic of Kalmykia, Kirsan Ilyumzhinov who was also President of the World Chess Federation, claimed that in 1997 he was taken from his penthouse apartment on board an extraterrestrial vehicle. Ilyumzhinov claimed that the extraterrestrials he met were humanoid and gave him a tour of their ship, and even took him to another world. There has long been claims that not only have extraterrestrials been visiting our world, but have actually lived among us. A well documented case in Italy called Amicizia (Friendship) revealed that more than 100 individuals, including senior public officials, had met with a group of extraterrestrials with bases in the Italian peninsula and the Adriatic Sea over a 22 year period from 1956 to 1978. Significantly, these extraterrestrials were secretly monitored by NATO authorities who did not interfere with private citizens meeting with and providing supplies to the extraterrestrials. The Friendship case, if genuine, suggests that something like the official agency created to monitor extraterrestrials on earth depicted in the Men In Black movies, is based in fact. Certainly, Prime Minister Medvedev appears to think that such a “secret special service” exists. While it can be claimed that Medvedev was giving a playful response to an off-beat reporter question, the full context of his off-air remarks suggest he was being candid on a range of topics, including extraterrestrial life. Plausible deniability certainly comes to mind when trying to analyze Medvedev’s frank off-air comments. This raises the intriguing possibility that Medvedev’s comments were orchestrated with prior approval to reveal facts to the Russian public that authorities are not yet able to officially announce to the world – extraterrestrials live among us. This article is copyright © and should not be added in its entirety on other websites or email lists. Permission is granted to include an extract (e.g., introductory paragraph) of this article on websites and email lists with a link to the original.